ENROUTE TO HUNTSVILLE, AL – Discouraging results from the Marksmen in recent weeks lead them into the final weekend of regular season play. Fayetteville comes off of a tough two games at Birmingham, dropping both games in the series by a margin. They allowed a shocking 10 goals to be scored in only two games last weekend. The Marksmen are in a rough patch at a bad time, as they have lost their last four games with the playoffs on deck. Fayetteville travels to Huntsville this weekend to finish the season off against the Havoc. These two teams have had one prior match-up this season; only two weeks ago at the Crown, which the Havoc won 8-2, opening up Fayetteville’s four-game slide. Due to the recent downfall for the Marksmen, they now sit tied for seventh in the league. Just a pair of weeks ago they were within a few points of fourth, now being all the way at the bottom of playoff teams. Even with the low-spot in the standings and the recent downfall, the Marksmen still have plenty to play for. This weekend will help get them ready for the tough road ahead in the playoffs. 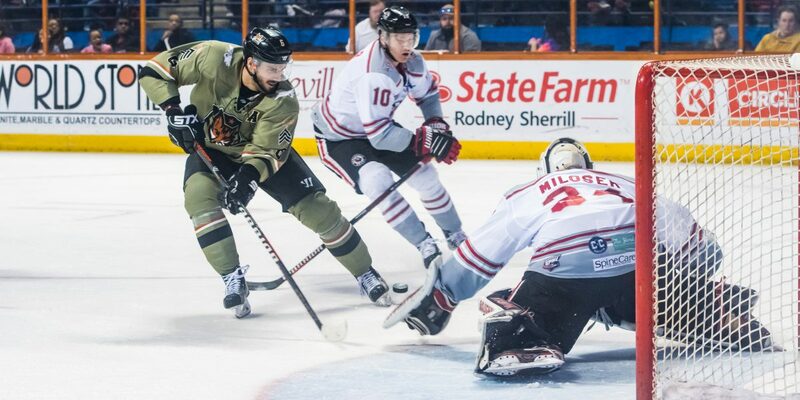 Huntsville is in a completely different boat than Fayetteville; The Havoc are locked in to the third spot, meaning they get the third choice of opponent for the first round. Huntsville – the defending champions – is trying to use this weekend as a tune up and a building block to try to make a run into late April. Like a broken record, special teams will again determine who wins this series. These two teams are first and second in the league on the power play. Fayetteville leads the league with a 22.3% success rate, Huntsville trails close behind at 21.4%. The team that can create space and find ways to take advantage of penalties will have the upper hand in winning the games. Penalty kill has been slacking for the Marksmen, as they’ve dropped all the way down to ninth in the league at 78.9% on the season. The last time these two teams met, special teams were awfully one-sided, as Fayetteville had just one power play, compared to two-handfuls for the Havoc. There will be a new goaltender suiting up for Fayetteville this weekend, as Jason Pawloski was claimed off waivers this week, replacing Nathan Perry. Pawloski, a graduate of Minnesota State-Mankato, saw time this season with Knoxville, starting five games and winning two. Pawloski looks to backup Dillon Kelley whom has been playing decent as of recent. Kelley has had to enter a few games in relief; a viewpoint that he’s not necessarily used to. He typically will make the best out of a bad situation and give up minimum goals in the time he’s doing damage control. If the Marksmen expect to win games and do well, they need to score. The offense has gone almost as quiet as the defense of recent, scoring only a pair of goals last weekend. The goals allowed have been way-too-high to only score two goals a game or even get shutout. Especially with the post-season only a week away, the puck needs to find the net. On the opposite side of the attack, the defense has been missing of recent. Fayetteville has given up at least five goals in the last four games; the outlier being the eight they gave up to this same Havoc squad. Goals should be at a premium come playoff time, and the Marksmen need to start defending that way. Fayetteville is currently tied for seventh place in the standings after their recent demise. The best place they can finish out in is fifth, barring a pair of losses by Pensacola, Macon and Roanoke. It’s not out of the picture, but a couple of points in these last four games definitely would have helped. The most realistic goal for the Marksmen is to win both games, Roanoke lose one and be tied for sixth when the last game goes final. Once the game goes final on Saturday, Fayetteville waits for Sunday night to find out their pairing for the opening round of the SPHL playoffs.